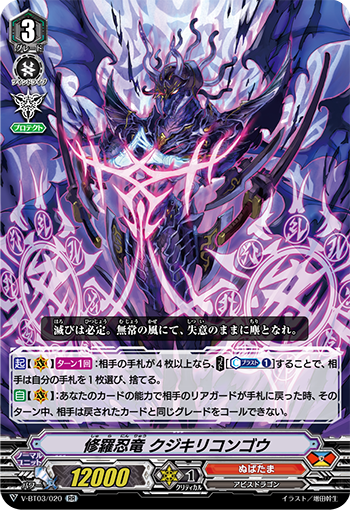 [ACT](VC)[1/Turn]:If your opponent has four or more cards in their hand, COST [Counter Blast (1)], your opponent chooses a card from their hand, and discard it. [AUTO](VC):When your opponent’s rear-guard returns to the hand by your card’s ability, your opponent cannot call cards with the same grade as the returned card’s until end of turn. [AUTO](VC/RC):When placed, COST [discard a card from your hand], and draw a card. Then, if your vanguard is “Shura Stealth Dragon, Kujikiricongo“, COST [Soul Blast (1)], your opponent chooses one of their rear guards, returns it to the hand, chooses a card in their hand, and discards it. [AUTO](RC):When placed, if your vanguard is “Shura Stealth Dragon, Kujikiricongo“, this unit gets [Power]+3000 until end of turn. Then, COST [Counter Blast (2)], return all your opponent’s rear-guards in the same column as this unit to the hand, your opponent chooses the same number of cards in their hand as the number of cards returned, and discards them.